In the middle of the 4th century B.C., the world surrounding Neapolis and Palepolis began to change. The Etruscans, never able to form their conquests into a coherent empire, fell into decline. In their wake, and harrying them into eternity, came the nascent power of Rome. The Samnite tribes had also grown in power and had left their hills and herds to begin the conquest of many of the important cities of Campania. Cuma, Capua, Pozzuoli, Nola and Herculaneum all fell to them, leaving Neapolis virtually surrounded. That the Samnites did not attack may have been due to the city's fortifications but the lack of fields and herds as tempting plunder may also have played its part. There was, though, a growing Samnite influence on the city, as the Romans discovered in 343 B.C. when they began their campaign of southward expansion during the 1st Samnite War. Desirous of some influence over Neapolis but conscious of the cost of taking the city by storm, the Romans preferred to negotiate a solution. In 328 B.C., during the 2nd Samnite war, ambassadors were dispatched to offer alliance with Neapolis. Under the terms offered, Neapolis would become a civitas foederata, thus maintaining its independence, government, institutions and language but giving Rome in return the use of its port and the promise of naval support in times of need. Such an alliance would also have weakened the Samnites' hold on the coast of Campania. Neapolis divided on the issue with the ruling Greek element coming out in favour of an alliance which would leave their position virtually untouched whilst allying them with the up and coming force of the day. Nevertheless, the pro-Samnite faction came out on top and, so, in 327 B.C. Rome declared war on Neapolis on the grounds that the city had been involved in hostilities against Roman colonies. Consul Quinto Publilio Filone headed the army which, sent to take Neapolis and Palepoli, found the latter reinforced with six thousand Nolans and Samnites and the former tightly ensconced within its walls of tufa. Filone camped his forces between the two centres, a tactic which was as sound politically as it was militarily in that it not only split the enemy's forces but also separated the Greeks in Neapolis from the more heavily pro-Samnite Palepoli, thus allowing internal divisions to come to a head. This proved to be the case when, even before the Romans had attacked, some of the leading citizens of Neapolis opened the gates to admit the besiegers. Able now to give their full attention to Palepoli, the Romans achieved a quick victory, completely routing the defenders. Whatever the repercussions were for the Samnites and their supporters, we know that the Romans were not vindictive in dealing with the city. Once having surrendered, the city was allowed to form the alliance previously offered, retaining, therefore, its full sovereignty and remaining essentially a Greek city. Neapolis was able to prosper during the first period of the alliance. Its mint was of particular importance as a source of income up until the period of the 3rd Samnite Wars when growing Roman ties with Carthage weakened Neapolis' monopoly of money production so much that by 280 there was a serious devaluation and the production of silver coins ceased. Yet, despite a worsening economic climate, the city remained well-defended and was even able to maintain an expensive troop of cavalry. The cities defences even proved too much for Hannibal, who was forced to lift his siege rather than risk being detained outside the walls of a city whose fleet could continue to bring in supplies by sea. The economic life of Neapolis suffered a serious blow in 199 B.C. when customs set up in Capua and Pozzuoli had a detrimental effect on commercial port traffic. Nevertheless, Neapolis was able to continue to grow in terms of military importance, acting as a fleet base and containing many arsenals. In 90 B.C. Neapolis was made a Roman Municipality and Roman citizenship was conferred on the Neapolitans. Citizenship was a highly sought-after status and would have only have been given as a recognition of services rendered by Neapolis to Rome. Interestingly, Neapolis tried to refuse the honour. This is generally interpreted as showing just how important the Neapolitans had come to consider their independence and, in particular, their status as a 'Greek' city. Rome, however, had its way, and although precisely what changes came in the wake of this promotion are lost to us, it must be assumed some degree of Romanization came with the passage from 'free-city' to Roman Municipality. Only eight years after this, the city backed the wrong man in the Roman civil war between Mario and Silla. The victorious Silla was severe in his punishment of the rebellious city. Apart from executions he dealt a crippling body blow to the prosperity of the Neapolitans by depriving them not only of their fleet but also the Isle of Ischia. This last was a vital source of raw materials used in the making of pottery: a valuable source of income as well as a source of artistic pride for the city. Nearby centres, Pozzuoli in particular, benefitted from Neapolis' plight, and the city now found itself outside the mainstream of Roman life and interest. The situation was not helped when, in 50 B.C., the city opted to support Pompey in his power struggle with Caesar. Having again thrown in its lot with the defeated party the city fell into a complete economic decline. Miseno had become the major military port on the Tyrrhenian Sea and even Baia competed for trade in tourism and thermal baths. Under Augustus, the city saw some recovery and the Emperor himself took an interest in the economic and demographic problems of the area but nature intervened with the earthquake of 62 A.D. and the tremendous eruption of Vesuvius in 79, neither of which helped to improve the situation. However difficult the centuries either side of the birth of Christ may appear to have been for Neapolis, the situation only looks bleak if we consider the life of the city from a strictly economic viewpoint. Indeed we find that despite hardships the cultural life of the city was flourishing and this may have been due in part to the very 'Greekness' which the city had been able to maintain through the centuries. Rome owed a great cultural debt to the Greeks and here, a mere chariot ride down the road, was a living inheritor of Greek culture, a survivor, if somewhat anachronistic, of Magna Grecia. Thus we find Roman poets and writers attracted to the city, important villas being built, Claudius publicly reading his poem in honour of his brother Germanicus, and a stage-struck Nero and his company of professional 'applauders' performing in the theatres of the city before touring Greece. This cultural life of Neapolis shines through even the darkest moments, and while the true importance of the role can barely be guessed at, there is evidence other than the presence of literary-minded and philosophical Romans and foreigners to suggest the cultural importance of the city. There were, for example, quadrennial games held in honour of Augustus. Lasting for four days, the 'games' included athletic, musical and theatrical competitions. Neapolis also boasted two theatres, one covered, the other open-aired. The former has been completely built over but extensive ruins (photo, right) of the latter have been uncovered (unfortunately, they are on private property and off-limits to tourists and, unbelievably, in some cases access is denied to archaeologists). The theatres were relatively large, suggesting the importance they must have played in the life of Neapolis. Quite whether the Roman theatres stand on the site of original Greek theatres is not known but authorities feel that is likely to be the case. 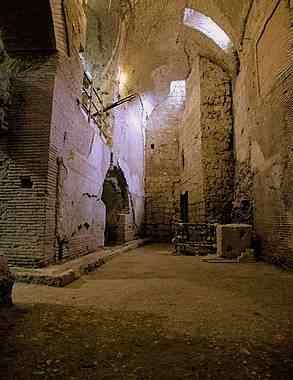 Fascinating revelations of the Roman and Greek city have come to light through the excavations under San Lorenzo Maggiore (image, above). Although these finds helped confirm some of what historians and archaeologists surmised about the ancient city, much remains in the realm of informed guesswork given that the modern city does not easily lend itself to excavation. All in all, little remains visible of the ancient buildings of Roman days though much is thought to remain under, possibly forming part of, the foundations of later buildings. To a large extent, the fortunes of Naples in the latter days of the Roman Empire were determined by the events happening throughout the West, although the city continued to show its determination to remain independent and remain once removed from events in the world at large. Whether this position had to be maintained through surrender, alliance or resistance to siege and attack, it is a stance which we will find the city still adopting even in the turbulent years of the Middle Ages. The year 410 A.D. saw the true beginning of the Barbarian invasions of Italy and in 429 the Vandals caused the depopulation of the countryside of Campania. Neapolis, still stoutly defended by its walls found that it had become a refuge for those fleeing the barbarian hordes.The walls were reinforced in 440 by Valentinianus but the invaders were by now unstoppable and when in 475 the boy Romulus Augustus was crowned in Rome he was allowed only ten month's reign before the Germans proclaimed Odoacre king and banished Augustus to confinement in Neapolis. The Gothic period was beginning but the true end of the Roman era came to an end for Neapolis in 536 when the forces of the Byzantine Belisario took the city by siege, beginning a period of nominal dependency on the capital of the Roman Eastern Empire: Constantinople.